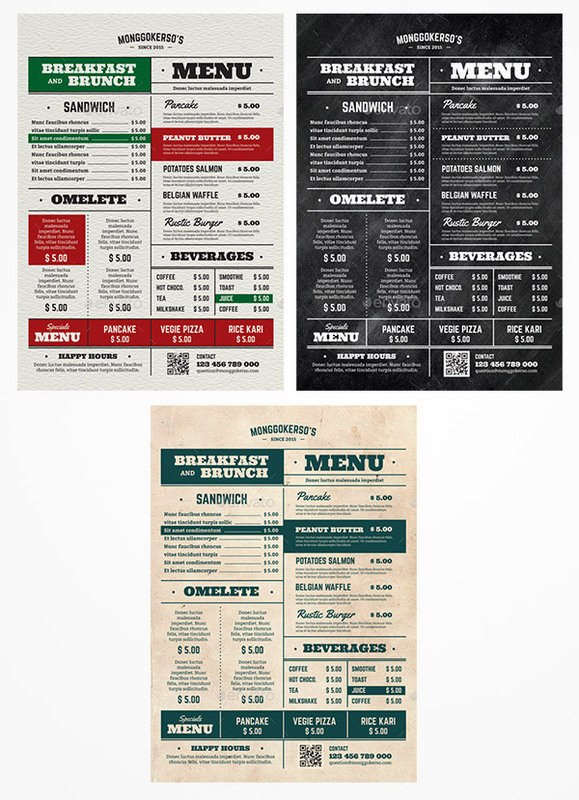 Creating a design of a menu for restaurants, fast food companies, or cafes is no easy task. A lot of factors are needed to be considered to come up with the best design that will suit both the business owner’s and customers’ taste. 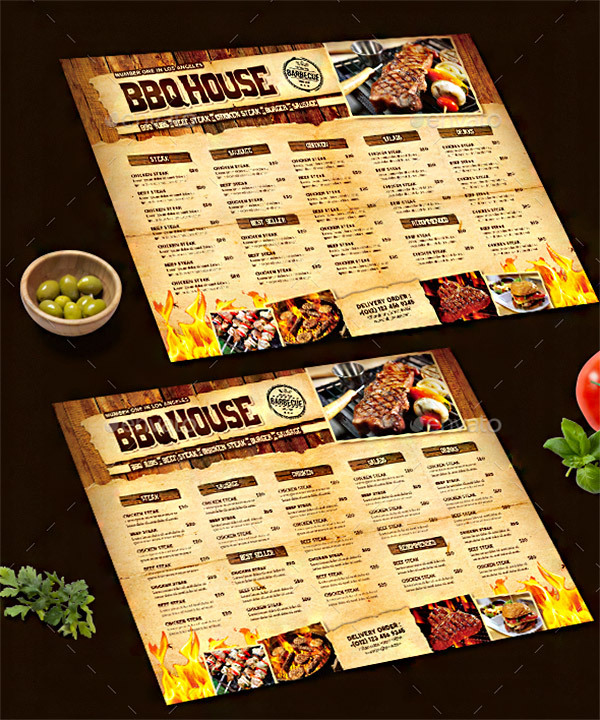 A menu showcases the items that are available in your service and subtly displays the theme of your restaurant. 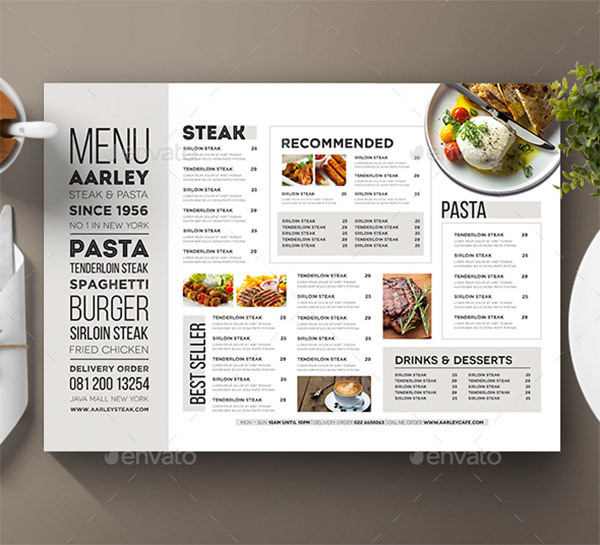 Since the food menu is the one thing that customers see before they make their decision. It is wise to design it in a way that it will give a good impression in your favor. 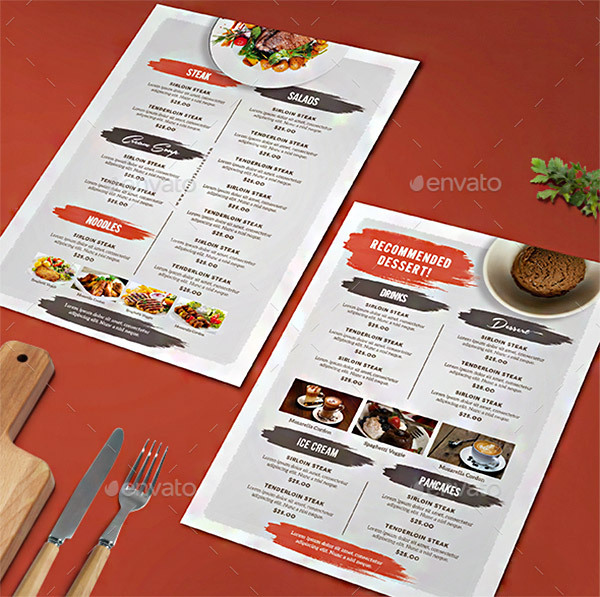 We have below a list of the best food menu templates that were created by professional designers. 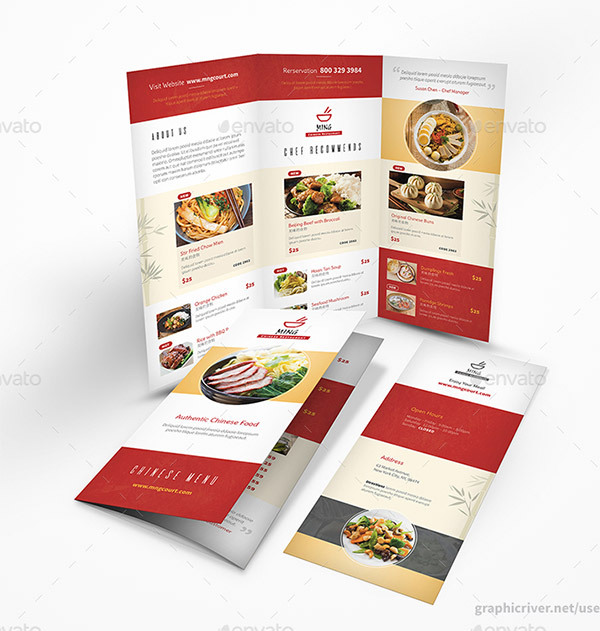 These templates are specifically created to effectively suit your needs for your business. Scroll down and check them all out. Come, take a peek, and choose your pick. This vintage-style template is in A4 size (210mmx297mm) with CMYK/300dpi setting. It comes in 2 PSD files that is easy to edit and ready to print. 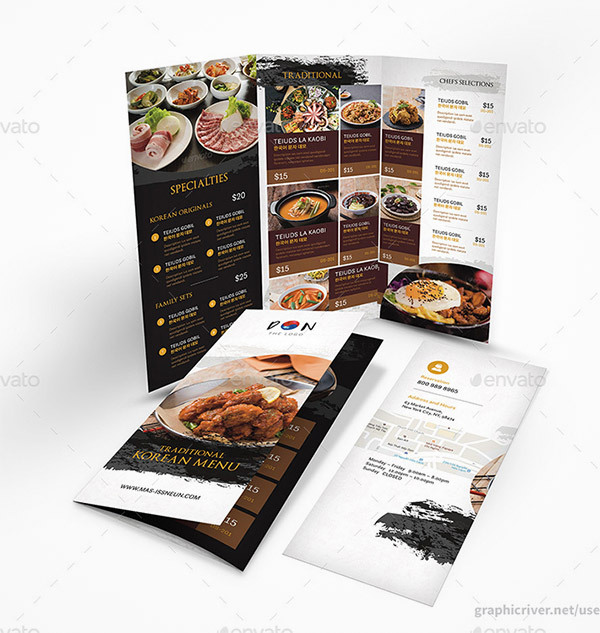 Here we have a trifold brochure template with an Asian-inspired design. It comes in various formats including PSD, AI, EPS, INDD, and IDML. It also has a print-ready setting (CMYK/300dpi) and drop-marks as well as bleeds. This template has a clean layout with a modern design. 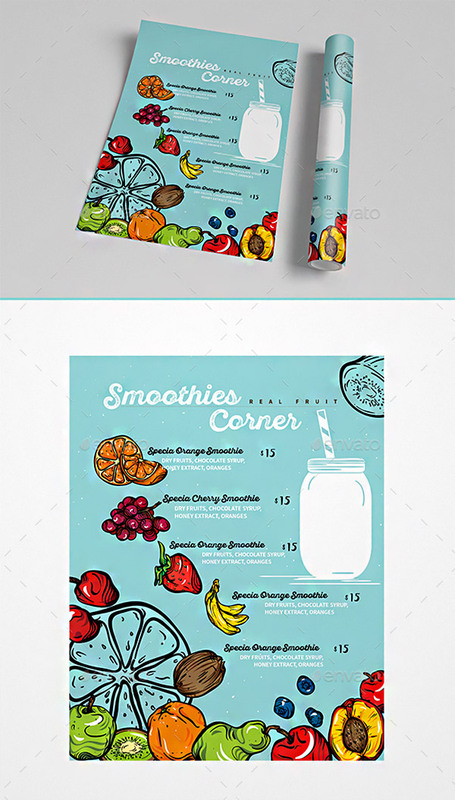 It contains 4 designs in A4 size and comes in PSD, INDD, IDML, AI, and EPS formats. They are all ready to be printed with CMYK/300dpi setting. Here we have a western vibe that is perfect for restaurants that offers barbecues and steaks. It is in PSD format that holds an A3 size template with bleed area. 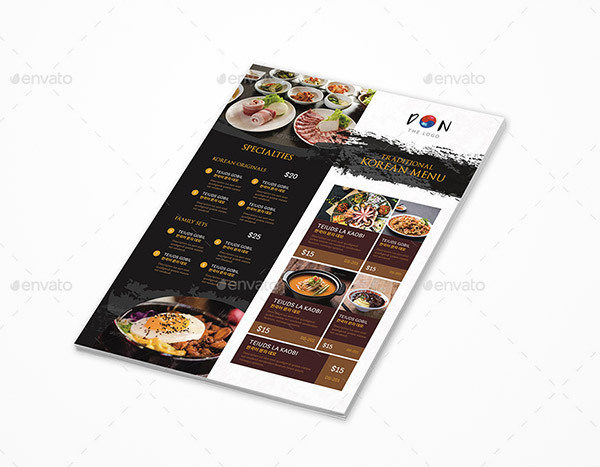 This is a clean and traditional style tri-fold menu for your Korean restaurant business. 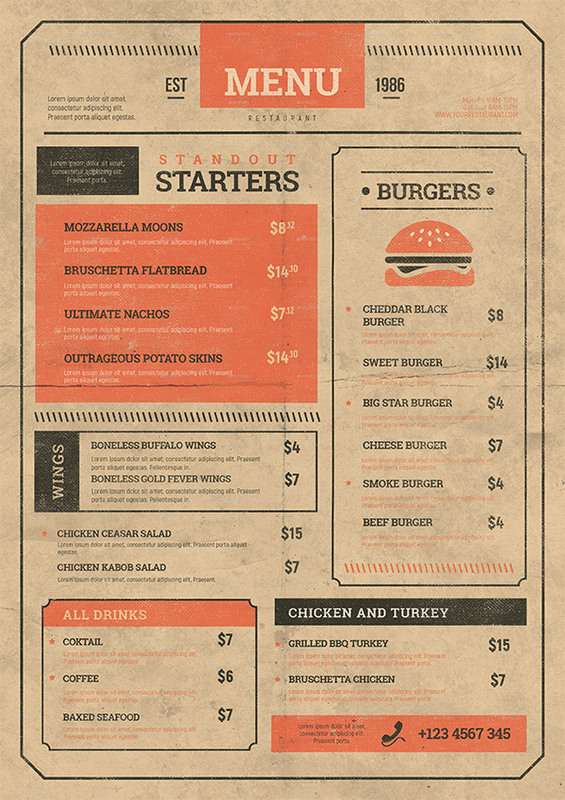 For this template, you have a neat and clean design that displays the menu in a modern manner. 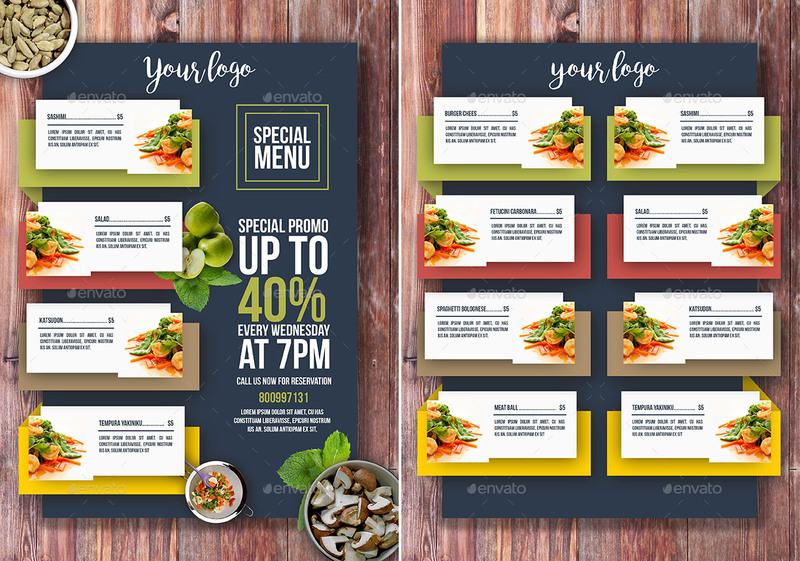 It has 2 variation designs that come in PSD format. This PSD file has well-organized layers for easy customization and offers 3 alternative color schemes. The template is in A4 size with bleed area. 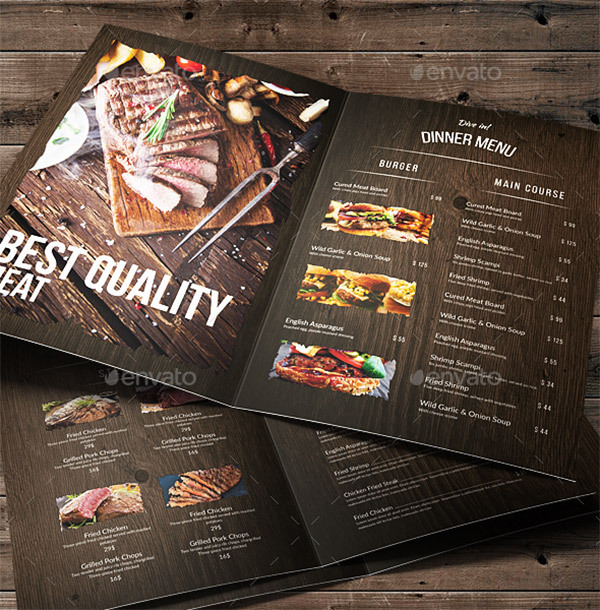 This menu bundle offers trifold brochures in A4 and letter sizes, bifold brochures in A3 and A4 sizes, and flyers that come in 4 design variations. This template comes in 4 PSD files that are easy to customize and the design only uses free fonts. They are in A3 and tabloid sizes with 0.25 bleed. 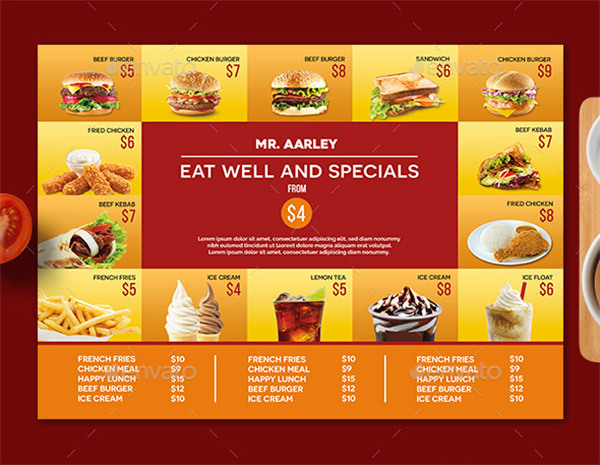 Here you have a fast food flyer design that is perfect for restaurants that sell burgers and pizzas. It comes in A4 size with 3mm bleed and is print-ready with CMYK/300dpi setting. 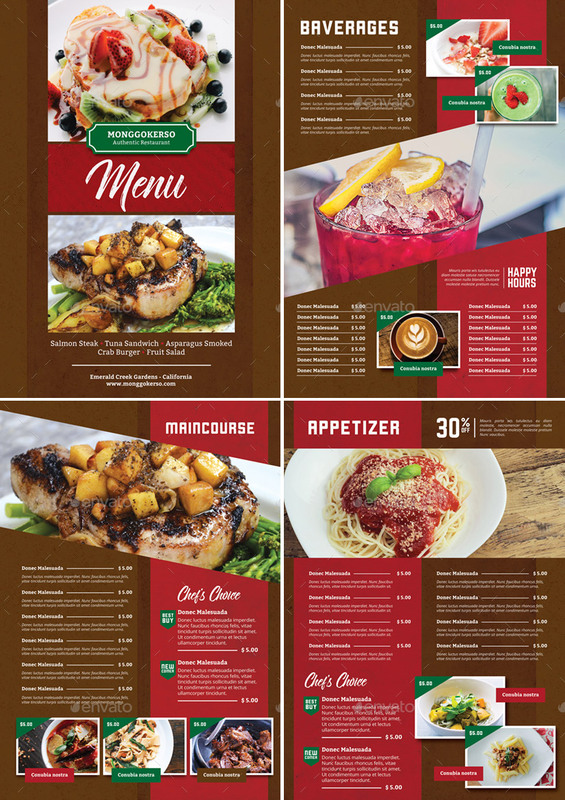 This menu template for restaurant has 5 various layouts that can be opened through Photoshop. The PSD file has well-organized layers and smart objects for easy editing. This one is for bars or restaurants that offer cocktail drinks. It comes in AI and EPS format that makes the template vector quality. It has 220x400mm with 5mm bleed area. 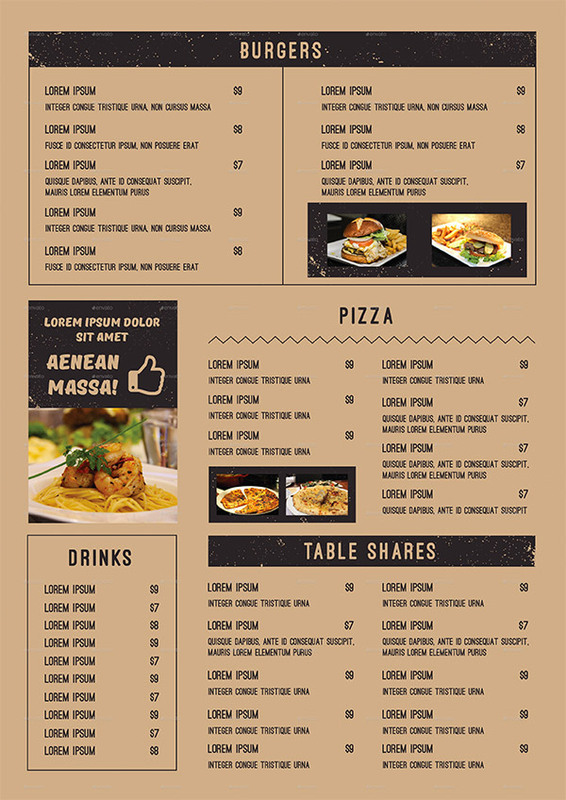 This menu has a refreshing design that is great for vegetarian menu. It has 10 variations, which are all easy to edit and ready to print. 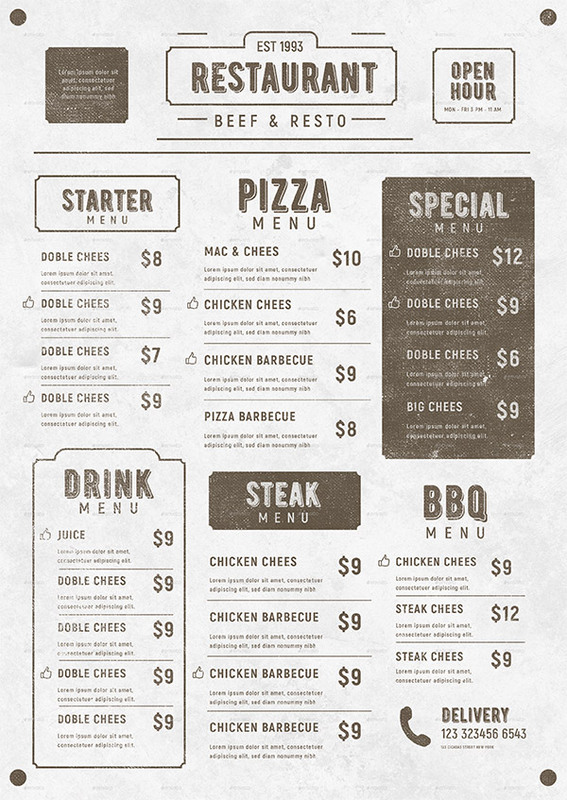 This chalkboard restaurant menu template can be used for restaurant, cafe, steak house, fast food, etc. The template is in A4 + bleed area with CMYK/300dpi setting. It has 4 variations that can be customized in Photoshop. 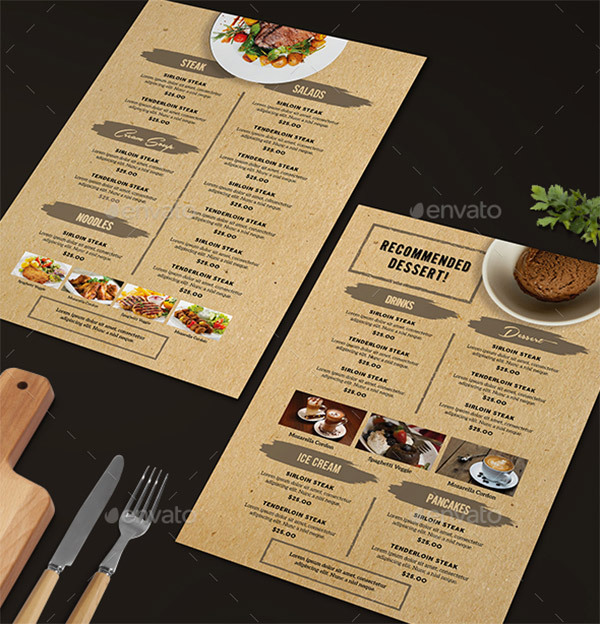 This template uses wood texture for its background and the design is perfect for menus that offer organic food. This next template has a picnic theme design with a beautiful layout to cater a lot of items. This flyer has fully editable layers that can be edited with ease. It is in A4 paper size with bleed and is print-ready with CMYK/300dpi setting. 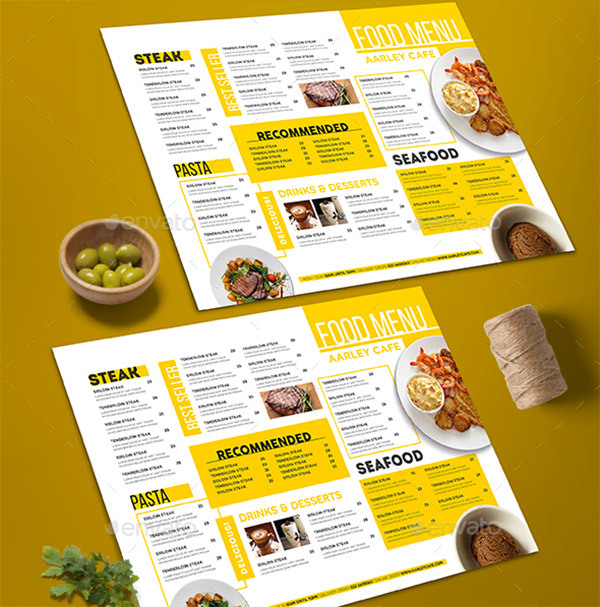 Here you have trifold and bifold menu templates in PSD format that are suitable for restaurants and other food-themed businesses. They are in A4 + bleed area and has well-organized layers for easy navigation. 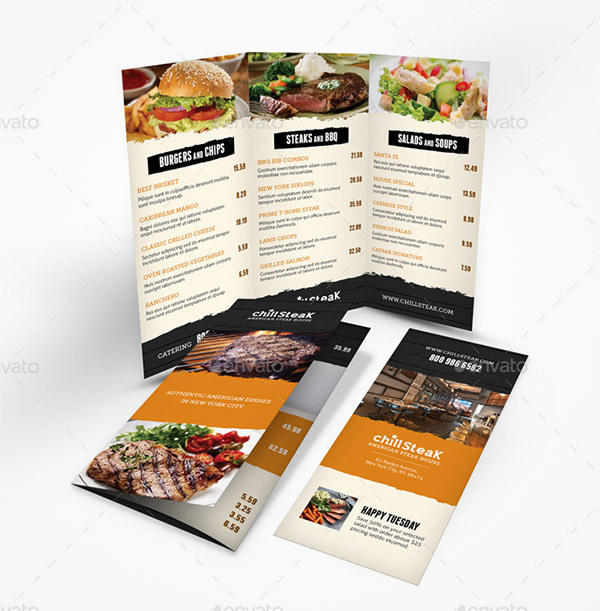 This set comes with single flyer, which can be used for restaurants related business prospects. 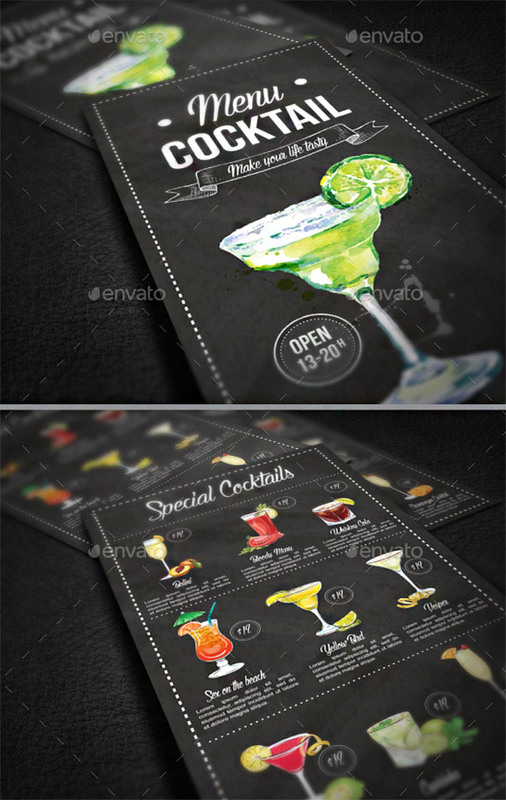 Here we also have a menu template for cocktails. 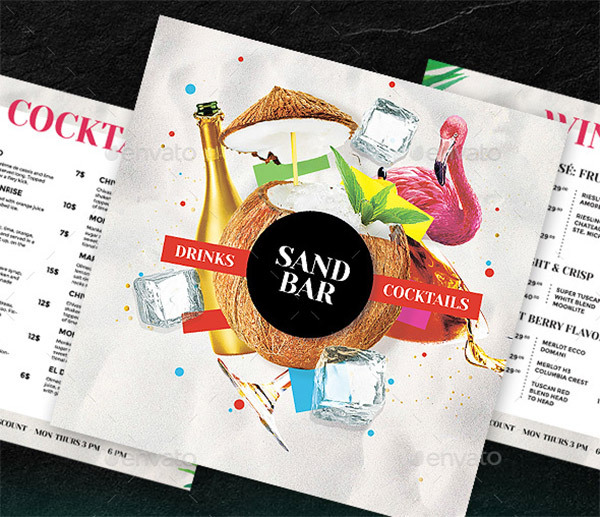 It is designed with a chalkboard theme and is made more interesting with illustrations of various drinks. This one also has a chalkboard theme and mixed with elements with jive well to the overall design. The images have tape on their corners to add more depth. The template has a square with bleed area. It has a tropical design that entices fun and party. 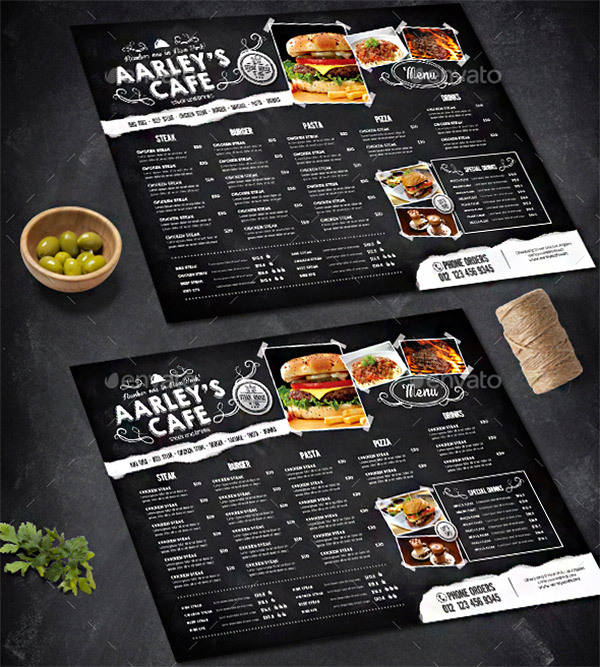 This design uses a blackboard for the background and white typography and graphics. The template is in PSD format and can be fully customized. 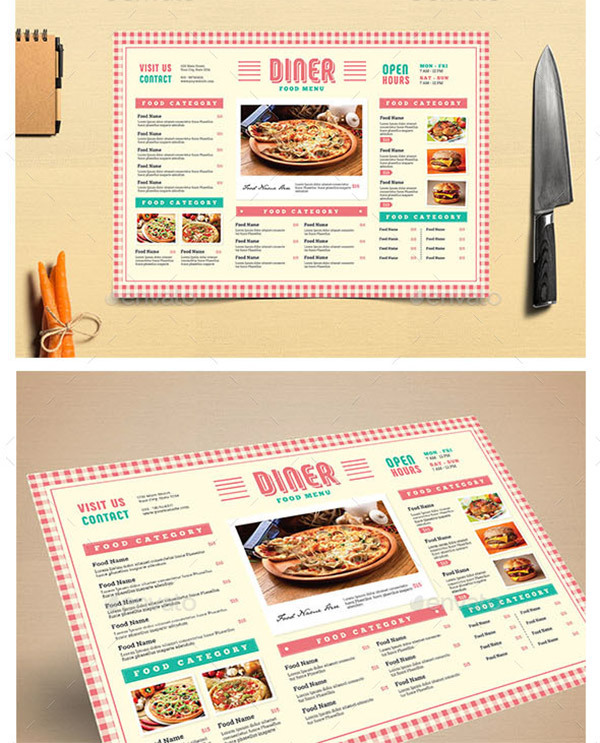 The PSD menu template is fully scalable and can be customized using Photoshop. All texts are editable (free fonts) and images can be changed through smart object. The template comes in A4 and US letter size with 0.25in bleed. It has 8 PSD files that are fully customizable and all of them use free fonts for easy editing of texts. 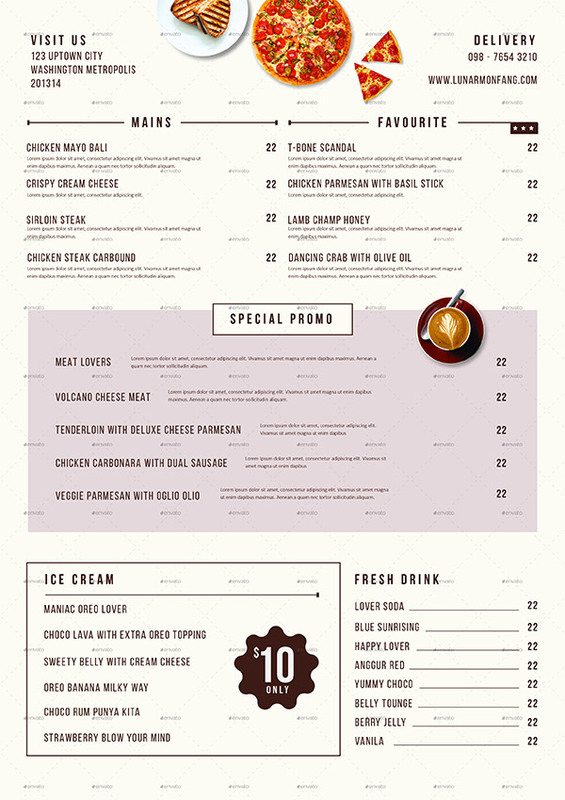 This template has an 8-page resto menu design that is easy to customize through free fonts and smart objects. 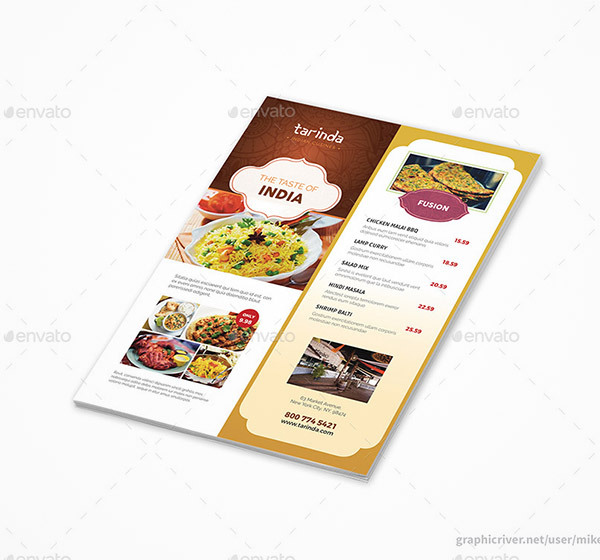 Here we have a flyer template for Indian restaurants. It is designed with brown-theme color palette that showcases an herby ambiance, which Indian cuisines are known for. This template will give you 2 PSD files that contain well-organized layers and smart objects that allow you to edit them easily. 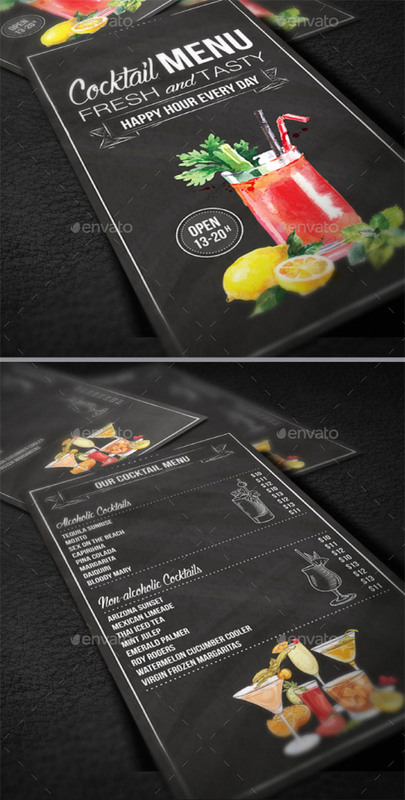 This PSD wood-accent template is perfectly suitable for restaurants, catering, grill bars, etc. 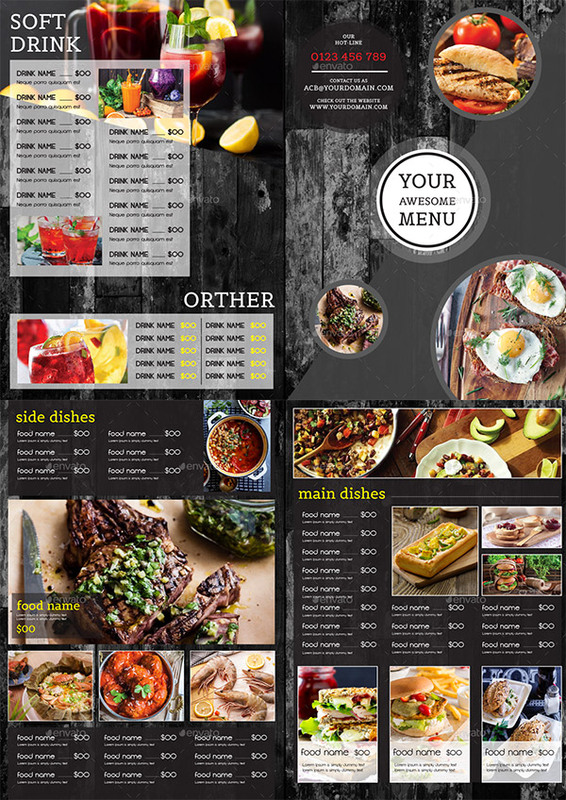 This modern menu template, can be used for restaurant, cafe, steak house, fast food, etc. Here you have a luxurious design that utilizes luscious wood texture overlaid with gold-themed elements. 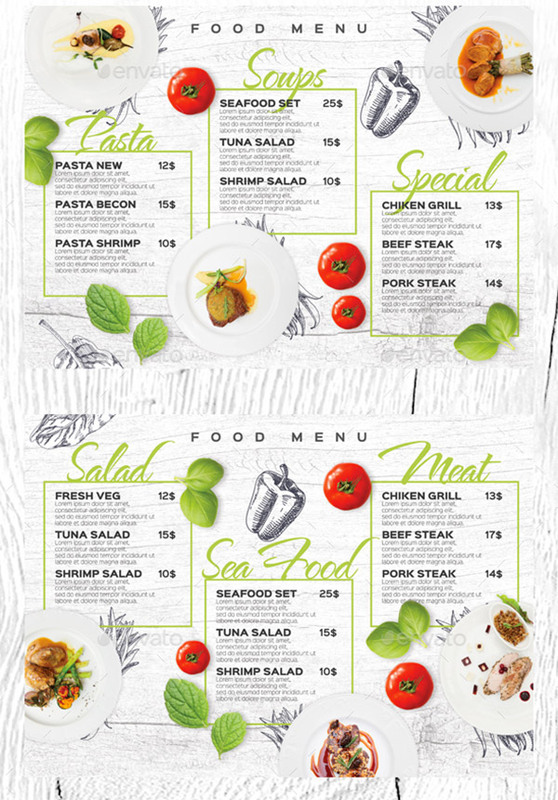 This beautifully designed menu template has a vintage ambiance with a perfect layout that will display your menu effectively. This clean and elegant template comes in EPS & AI format, which you can open in Illustrator to edit the elements to your taste. 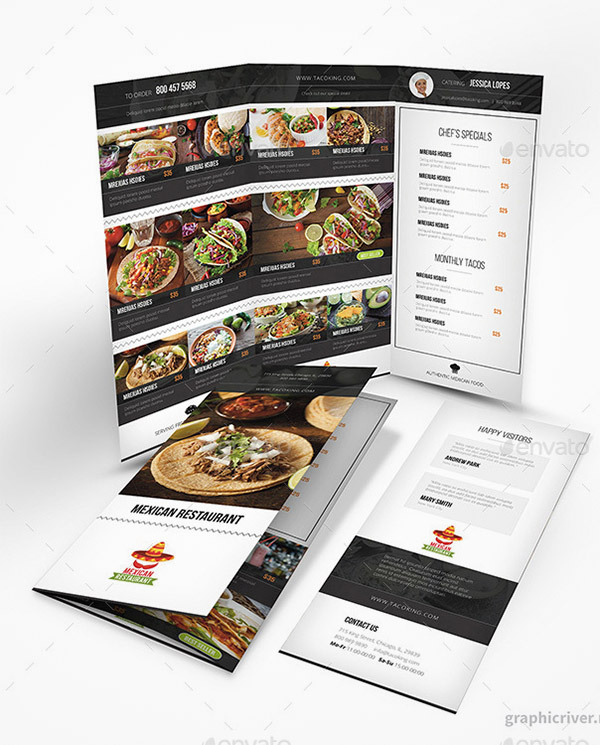 This template has a 4 pages design with A5 size. It comes in AI and EPS format and is compatible to Adobe Illustrator CS6 and later versions. The template is in Mexican-theme and has 8.3×11.7in dimension. It has 2 PSD files that are very customizable to your preferences. This bundle holds AI and PSD files, all in CMYK/300dpi setting and well organized for easier navigation and customization. 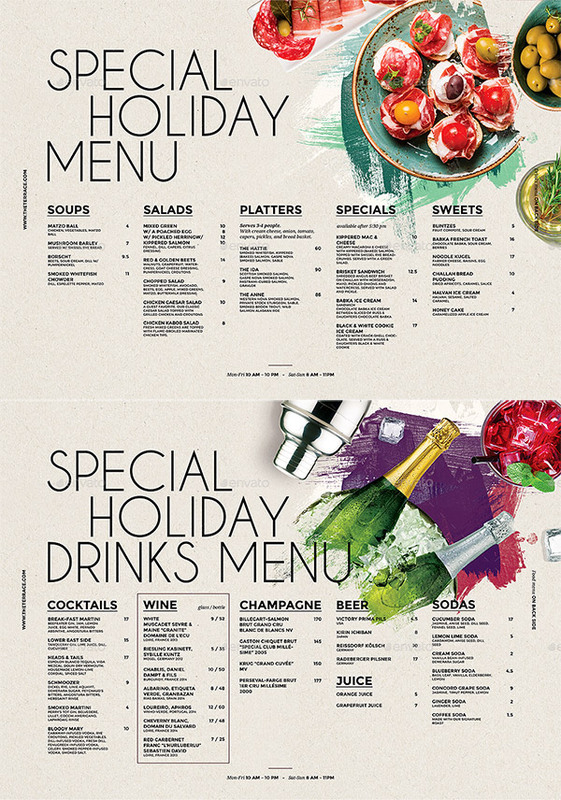 The colors used in this design suits well to restaurants and other food-related business. Additionally, it has unique layout where the items are placed on the sides of the board. This template is in PSD format and has an A4 size with bleed area. It has 5 various layout designs, all easy to customize via free fonts and smart objects. It has an A4 size with bleed area and a print-ready setting (CMYK/300dpi). The template also has 4 layout design variations and are all easy to edit. 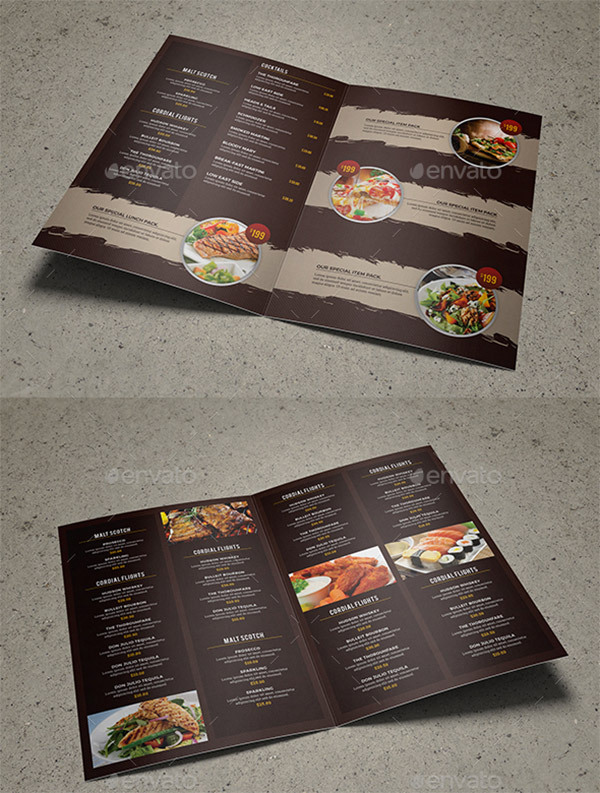 Brown Restaurant Menu template has an A4 size + bleed dimension and PSD format. This PSD template is easy to customize with its editable font, color, and images. It has a simple yet elegant design and is suitable for any food-related businesses. 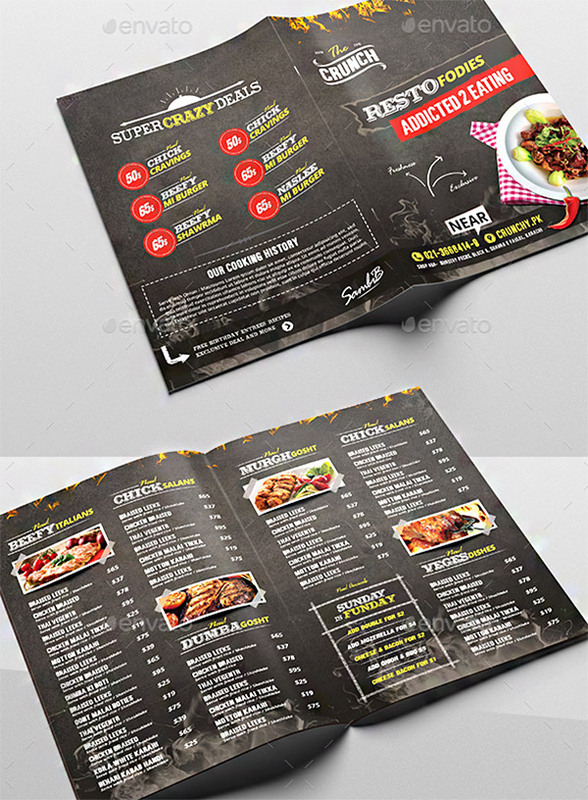 Here you have a clean and modern flyer for your Mexican restaurant business. It has A4 size and comes in PSD, INDD, IDML, AI, and EPS. This menu has a 303×426mm including the bleed area. It is in PSD format with well-organized layers that will make your customization process easier.